Last year I mentioned there were a few houseboats on the river, here are three more, each one of completely different character. They lie upstream of Bunny Meadows in what was called Crablake. First up is what looks like a steel lighter, with an oversize garden shed on deck. 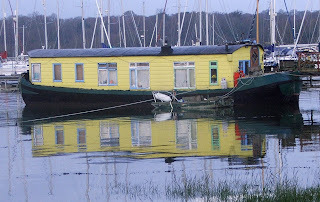 That said, I do like the curved roof and the yellow paintwork, I often see swans pecking at the window so I guess the owner feeds them regularly. 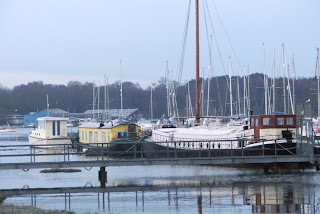 This barge is authentic, built in steel and exactly the type you still see on some of the major European rivers. Whether or not she could sail I don't know, but that mast is a substantial price of kit, I bet it's "fun" lowering it to shoot a bridge. 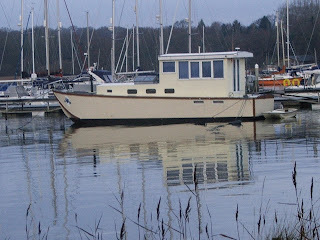 Built on a motorboat hull, this houseboat has been receiving a lot of upgrading and maintenance over the last year of so and looks lovely. All three have walk ashore access and dry out on the mud between tides. I've often wondered if boats in the UK that sit on the mud every tide suffer from the worm decay we see here on the west coast of the US. 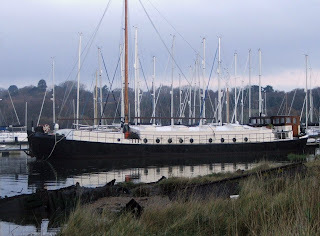 If a wood boat sat on the mud every tide where I live it would be sunk in three years. I guess the solution is to not use a wood boat for a live-aboard. That barge is huge! Imagine the accommodations. Michael, we have places locally where the the Gribble will eat your keel for lunch and the planking and frames for dessert!